Today is National Running Day. I understand that running is not for everyone. But if you’re looking for a way to get back in shape – and feel a sense of accomplishment – running could be your answer. I’ve run on and off over the past 15 years, including regularly over the past two years. The truth is, my eye-hand coordination never has been great, so I’ll never excel in most sports. Even I, however, can put one foot in front of another without falling. I try to run three times a week for at least three miles. It helps bring some order and discipline to my life, and it helps me fight stress. I also think it keeps my brain in shape. I have fewer incidents now where I find myself fishing for a word or a name that just won’t cough itself up out of my brain. Credit goes to Coe Kirby for getting me back into running. Coe is a fitness trainer in Phoenix, and I’ve been working with him for the past two years. He has encouraged me to keep running and to increase my distance. For the first time ever this year, I ran in a 10k event. I’ve also run my longest distance ever, eight miles, and I’m planning to do a half marathon in January. It’s a little tough to run in Phoenix in the summer. You have to get up early to beat the heat. But as long as I start running by 7 a.m., I can at least get in my three miles. 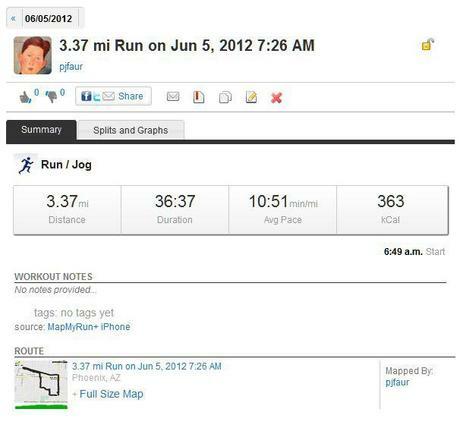 If you’re going to run, and you have a smartphone, I recommend using an app like MapMyRun. I use the free version. It logs every run I make. It also offers voice feedback, so every five minutes, the app interrupts the music I’m listening to in order to report the time I’ve been running, the distance, my overall pace and my current pace. If you’re just starting out, don’t worry about how much distance you cover. 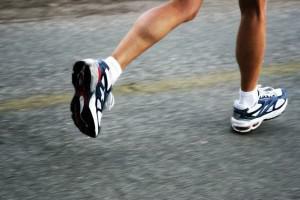 It’s more important to establish the habit of doing running on a regular basis. For my running friends, today’s a day for celebration. For my non-running friends, think about putting on a pair of running shoes and giving it a go. Better yet, follow the advice of Yoda and Nike: Don’t try, do. Or, just do it!